Each exercise is aligned with learning outcomes as per the Primary Language Curriculum. Visual, auditory, kinesthetic and tactile activities provide a framework structure for beginning readers, while enhancing learning and memory. Themed units link learning across the Activity Books and interactives – The Funfair, The Market, The Toy Shop, The Zoo, The Park, The Restaurant, The School and more. Videos demonstrate correct pronunciation and mouth movements for each sound specific to Irish diction. Animations and interactive posters reinforce letter recognition, categorisation and formation. Teacher-led and pupil-led interactive games provide meaningful learning experiences (beginning, ending, middle letters, CVC words, early blending/reading and more). 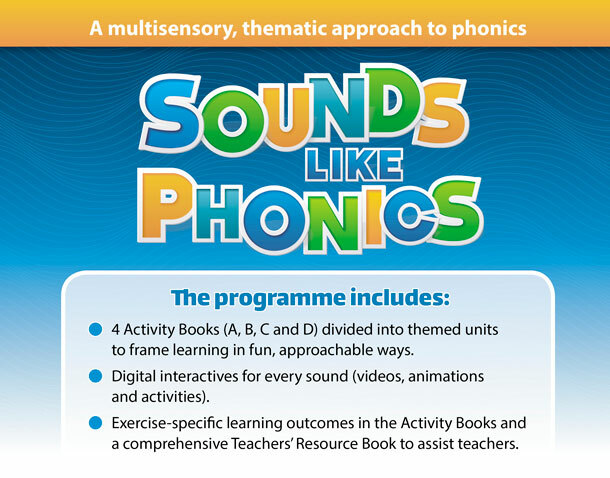 The TRB supports the Activity Books and interactives, with additional resources such as rhymes, songs, class games and worksheets.